Dad (me): I've got a new book for us to read tonight. 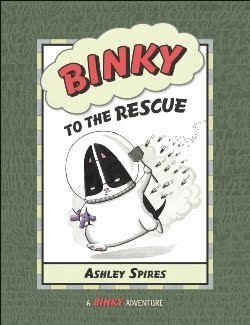 Mariah (daughter, age 5): It's another Binky book? Yay! We have the Space one where he always tooted (farted). Mariah : “Human Litter Room, ” giggle, hahaha….giggle. Mariah : I really like Binky books. Dad: What was your favourite part? Mariah: The tooting. No.....when Binky saves Ted....and the tooting. The art is very nice and there are just enough words. Have you tried reading a comic to your kid at bedtime? Some of them can be very wordy, but Binky to the Rescue , and Binky the Space Cat , contain just the words necessary and will not make you want to hide the book away thus eliminating future readings (don't look at me that way – you know exactly what I am talking about. That Care Bears book that never seems to end didn't just walk away on its own). That isn't to say that the book is an unchallenging “Easy Reader”. The age recommended by the publisher is 7 to 10, but I think some of the vocabulary leans more towards 10 than 7. “Collateral damage”, “relentless pursuit”: great stuff. If you are going to read it to a child, I would get this for aged 3 and up. Ashley Spires has gone 2 for 2 in the “Can we read it again” category with her two Binky books and my kids and I are eagerly awaiting number three. This one won't be available for you until September 2010. Keep your eyes peeled, or pre-order it here. Welcome to our second Comics in the Classroo podcast - our first focusing on kids books. I focused on some kids books that I had put off for far too long. Two of them are biographies with amazing art: The Fantastic Undersea Life of Jacques Cousteau and You Never Heard of Sandy Koufax?!. Then I change gears and review a book for younger readers (k-2), Little Mouse Gets Ready. Hope you hear something useful to you. And, my new site for the comics I create for - and about my kids: We Fight Robots!